The goal of Question Answering System is to find answers to user question. Information Retrieval based question answering find answer given a collection of documents. 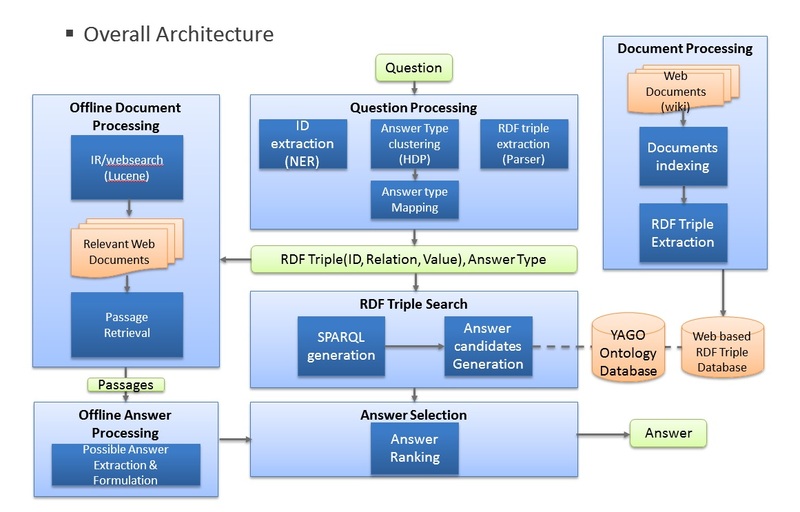 There are three steps in open-domain information retrieval based question answering. First step is question processing. In the question processing, we extract triples from the question and semantic answer type. Semantic answer type is the expected type of answer and it may occurred in the question or not. We find passages which is expected to include answers from document using the result of question processing. We use hybrid approach in document processing. We search not only unrefined texts but also use refined triples data. Finally, in the answer selection we extract answer candidates from the passage and triples data. We rank answer candidates using scoring algorithm and extract final answer. Copyright © 2013 - All Rights Reserved - Intelligent Software Lab.